Happy Inauguration Anniversary Lake Burley Griffin! With the assistance of an ACT Heritage grant, 'Sunken Stories of Old Acton’ takes a journey back into the sunken landscapes of Acton’s past, sharing stories collected between 2011 and 2014 from Canberra residents who either lived in Acton, or have memories of the area. The website contains our final edited selection of video and audio interviews - presented in themes, along with accompanying images and maps. The site also features the creative reflections of students from the ANU School of Art who engaged with the project in 2013 and exhibited their works at the Nishi Gallery in NewActon. 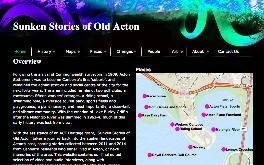 We hope you enjoy exploring the selection of voices and stories from Acton's sunken past!